I’ll never tire of Django Reinhart and the way his melodies trickle through the thick summer air. The slightly French tunes vibrate throughout the house during these long, hot days and spark all manner of creativity. Much like rhythmic music makes your body move, at times even against your will, so it goes with Django and creativity. To me, they’re one in the same. The creativity can manifest as all manner of homemaking – even laundry folding or linen ironing can make the list. But as of late, it’s been jam making. 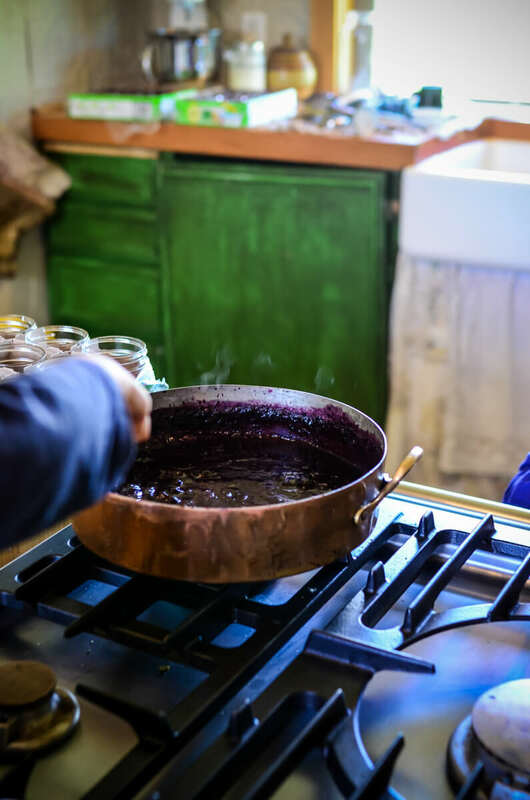 The sweetness of the berries bubbling away on the stove while the children sit on the counter and lick the spoons that I’ve told them half a dozen times to leave in the pot. But I’m not serious, am I? Because what possible greater joy could there be for a child than to lick a spoon dripping with honey-sweetened fruit? I can’t even be upset about it because I want to the same. And I do. The pound-of-fruit-to-pound-of-sugar recipes that litter the internet may be popular, but I find them unnecessarily sweet. The gentle flavors of summer berries are all but lost amongst the numbing sugar which, in my world, is a serious culinary loss. 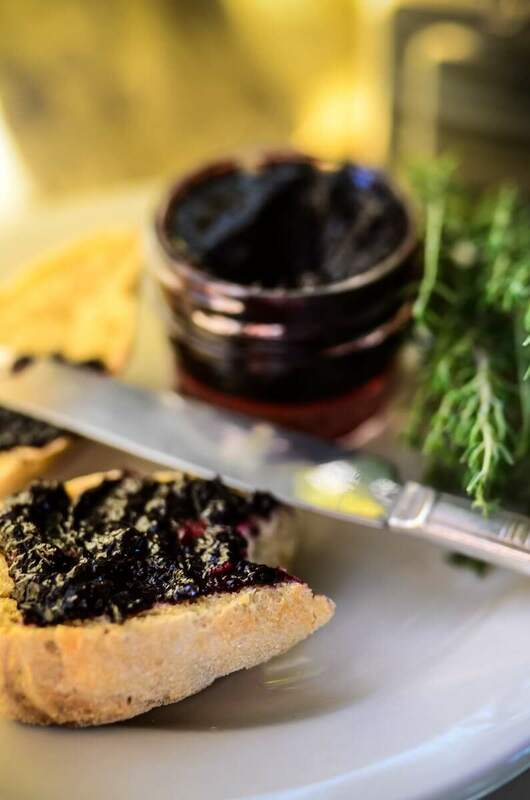 I was taught by a mentor years ago to do all on the farm with a culinary end of in mind and it is to that end that I make this honey-sweetened jam recipe. The honey is sweet, the fruit is flavorful and tart, and I am left fully satisfied on all accounts. For what it’s worth, the recipe can be altered to include any fruit. 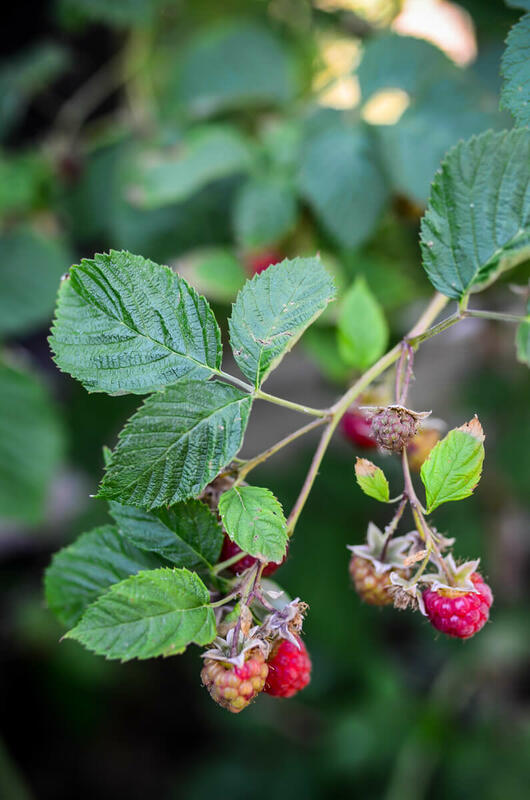 Thus far, apricots, cherries, raspberries, and blueberries have already met their maker in the hot pot using this recipe – soon to be followed by the coveted July blackberry. Sub as you wish but keep the ratios. 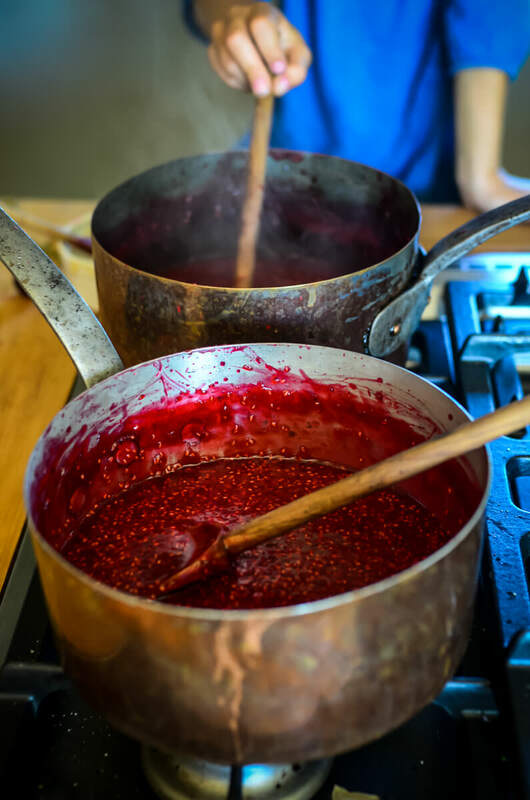 Jam has a hard time setting in large batches, so instead of doubling or tripling the batch in a single pot, simmer small batches in multiple pots on the stove. 1. Combine the fruit, honey, and pectin together in a saucepan. Over medium heat, bring the fruit to a simmer, stirring constantly. It will bubble, start to gently foam, and do all the beautiful things jam does! 2. 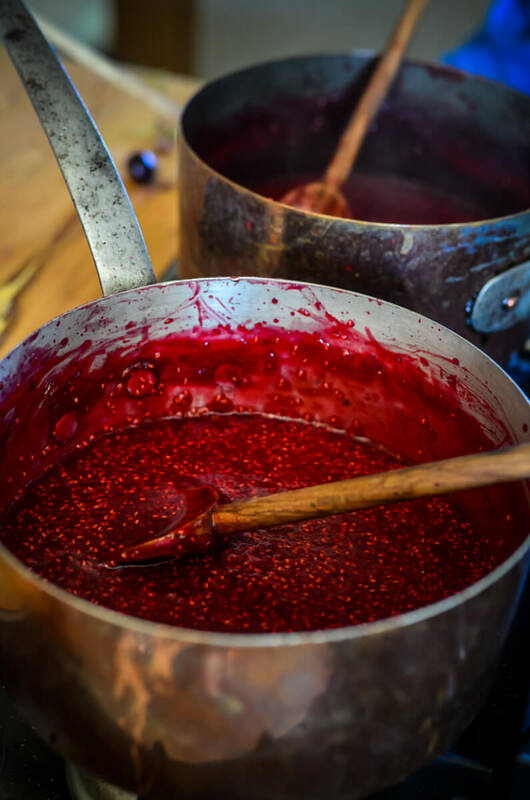 Allow the jam to simmer for fifteen minutes until it will thickly coat the back of a spoon. 3. 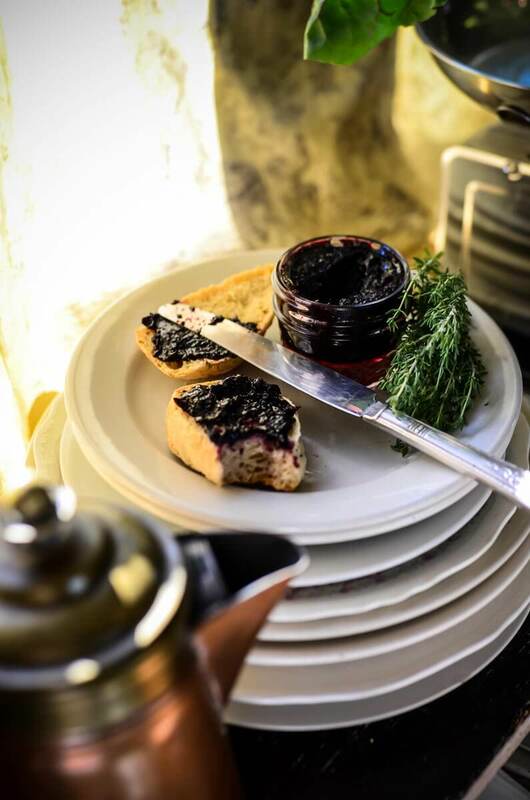 Carefully spoon the jam into the jelly jars, put on a new lid and band, and gently tighten. Flip the jar upside down on the countertop and let it sit for a day. 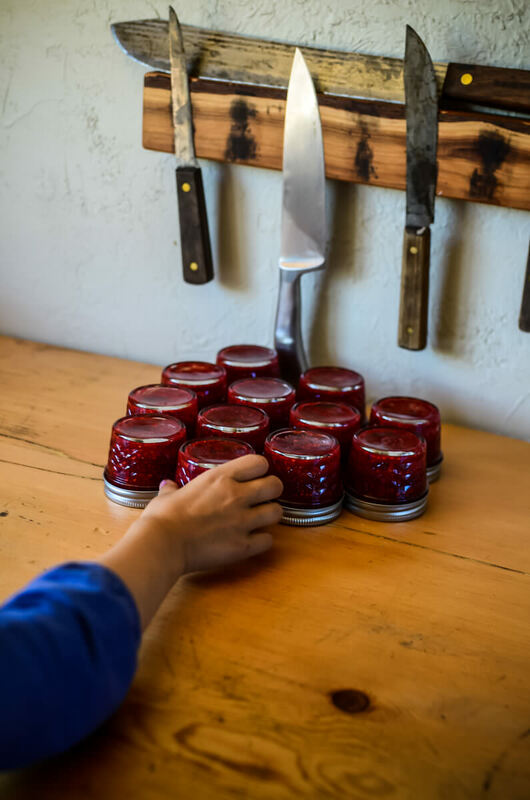 In this time, the hot jam will cool and in doing so, create a suction on the lid – thus, sealing the jar. This is an old method called “hot pack” and so long as the jars are sterilized and the jam is hot, you’ve nothing to fret. Plus it keeps you from heating up a large water-canner unnecessarily. 4. So that’s it. I feel like I should have more to offer you in the way of this recipe, but part of its joy remains in the simplicity of it. Currently, the root cellar that sits below our kitchen is in the fires of refinement. I put far too much love into fruit harvests and honey-sweetened jam stirring to allow such beautiful ruby jars of sweetness to sit on the dirt floor. Instead, with the help of some industrial metal shelving, I’m working on creating a real food farm grocery store of sorts. Jars of jam, pickles, curing meats, and spices will be lined up on the shelves, like little soldiers awaiting culinary orders from yours truly. I swear that’s half the reason I make jam. While Stuart hauls five-gallon buckets of gravel down the narrow, creaky staircase ito the cellar, I’ll stand by the stove and stir more pots. There are, after all, still delicious fruits to be savored. « Cottage Bathroom: Before and after! I can’t wait to try this recipe on the blueberries we got yesterday out in Carnation. I am curious if you used Pamona’s Pectin? Did you have to add calcium water at any point? This is very timely, it’s my second year of keeping bees and the first year we’re getting much fruit from our new bushes. Next year, I’ll be having a go at this. Yes, I’m curious too…Pomona’s pectin. Did the jars have to be hot before you put the jam in them? Can’t they crack if not? Just put Up 35 pints of plum jam the old fashion way. Needless to say my house was a sauna. Wish I’d seen this post earlier. Can you juice the fruits and use this same recipe with just the juice? My dear husband will only eat seedless jelly…. I was wondering the same about the pectin….. what do you use for low sugar pectin? If you wash your jars in a dishwasher, does that sterilize them? Or do you have to put them in boiling water on the stovetop…? Wash the jars. Turn your oven to 225F, place the jars on a cookie sheet, stick them in the oven for 10 minutes and VOILA= sterilized jars! I love the hot pack idea! In what situations would you not want to use this method for sealing the jars? I don’t currently have a canner so I’m looking for an alternative method. You can ONLY use this method for fruit jams and jellies, tomato sauce. Ie: things with high acidity. You cannot use a hot pack method on any low acid food such as beans, squash, corn, etc. or meat. Those absolutely MUST be pressurized in a canner to prevent botulism.